Home > National Parks > Francisco P. Moreno N.P. 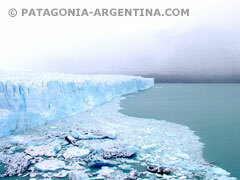 Lenga woods, two lacustrine systems, a part of the Patagonian steppe, fossils and a very rich fauna are part of this Park, which occupies 115,000 hectares on the northeast of Santa Cruz province. At this part of the cordillera, the layout of the mountains resembles a huge amphitheater. Regarding the vegetation, there are three, well differentiated zones: the steppe (to the east) with coironales and twisted mata; a transitional zone with short vegetation and finally the wood, almost exclusively of Lengas. 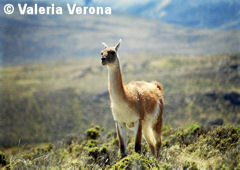 As for fauna, one of the features of this Park is the great quantity of guanacos that wander in groups. There are also choiques or dwarf ñandú, the pilquín or orange chinchillón, a species that only appears in Santa Cruz, and of course the huemul, an autochthonous deer with a robust, grayed body. During winter, the huemul descends from the mountain towards the woods and valleys in order to obtain food. In terms of birds, you can find both aquatic and high altitude ones. 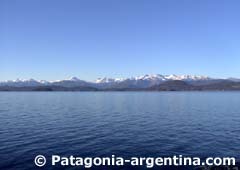 Among the former, flamingos, hualas, black necked swans, ducks and cauquenes abound. The latter category is mainly represented by the Andean condor. No exotic species have been introduced in the lakes thus the native fauna can be spotted there. 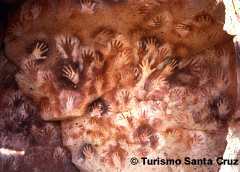 The first inhabitants, before the tehuelches, lived in caves and rocky eaves over the rivers, where they left rock art signs. This is one of the cultural treasures kept by this Park. The most important can be found at Casa de Piedra Hill, where there are 7 caverns. 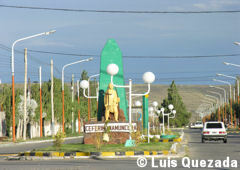 Closest town is Gobernador Gregores, 220 km. on Route Provincial Nº 25, which is in part of gravel. This is the only town in the area where gas is available for your car. 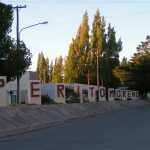 From Perito Moreno you get by driving along Route Nacional Nº 40 up to the crossing with Route Provincial Nº 37 which leads to the National Park.